Tonight I am alone. My cellmate (one day you’ll know his name) is in the sick bay. He’s a good guy, but sometimes it’s not such a bad thing, being alone. I can think more clearly. I don’t have to screen myself off to think of you. You’ll say that four years, five months and fourteen days is too long to spend just thinking things over. And you’re right. But it’s not too long to spend thinking of you. Santiago is a victim of the 1973 political crackdown in Uruguay, and it’s been a long time since he’s been able to see the woman he’s writing to. Unfairly imprisoned, and with a rather uncertain future, he’s attempting to make it through the long years by focusing his mind on those waiting for him outside. It isn’t long before we get to meet them, too, with the story taking us to a collection of exiles over in Buenos Aires. Along with Don Rafael, Santiago’s father, and Beatriz, the nine-year-old daughter the prisoner misses so much, there’s his wife, Graciela, a beautiful woman who is starting to have doubts about her marriage. This is partly due to the presence of Rolando, Santiago’s comrade in arms, and Graciela’s comforter during his friend’s absence, and while the couple feel guilty towards poor Santiago, it seems only a matter of time until they decide to take the next step. Springtime in a Broken Mirror is an examination not so much of a political situation, but of its consequences. While Santiago is at the centre of the story, the true action occurs elsewhere. Benedetti shows that the effects of political arrests radiate outwards, impacting on many more people than you might expect, and by allowing his characters to speak in a series of monologues, he reveals the effects such an arrest can have. Don Rafael, an ageing academic, his struggles to write to his son, despite their strong relationship, but he does his best to keep a watchful eye on the rest of the family. There’s Beatriz, who (of course) is missing her father, and her sections of the book are brief and amusing, full of misunderstandings. The writer cleverly shows a child trying to make sense of words such as ‘liberty’ and ‘amnesty’, that are bandied about by the adults around her. Having spent half her short life in Argentina, she’s also confused about which country she belongs to, wondering how Uruguayan she really is. Gradually, though, her monologues begin to lose the childlike innocence of the first passages, showing the clouds overshadowing her sunny nature. Graciela also has her darker moments, but unlike her daughter, she has choices and temptations. A working woman, she finds herself growing apart from her incarcerated husband, realising that while she loves and respects him, she doesn’t need him. With the man she admires and desires just around the corner, infidelity seems inevitable, yet both Graciela and Rolando are hampered by the knowledge that Santiago has done nothing to deserve their betrayal, putting off their affair in the hope that time will somehow come to their rescue. All Santiago has to get him through this time of hardship is the belief that there’s a life waiting for him on the outside. However, if and when he does get out, he might find that life has moved on without him. While the story is excellent in itself, an intriguing feature of Springtime in a Broken Mirror is the way that there’s one more voice added to the range of character’s monologues, namely that of the writer himself. In a series of chapters entitled ‘Exiles’, Benedetti provides interludes full of his own experiences as a man in exile, and descriptions of the people he meets. These range from an ‘Australian’ plumber in Havana to a Bolivian politician who is no stranger to being exiled himself, and wherever the writer goes (even behind the Iron Curtain! ), he manages to find a Uruguayan with whom he can discuss his mother country. Several of these stories bring a smile to the face, not least of which is one where an exiled Uruguayan family in Cologne receives surprising help from the local community. For the most part, though, there’s a sadness pervading the lives of these reluctant emigrants, and even those who have barely escaped with their lives are plagued by homesickness. In one sombre tale, the writer realises that what he and his friends always imagined to be a temporary exile may well be a far lengthier ‘sentence’. The truth is that not all of those who fled their homeland were destined to ever see it again. 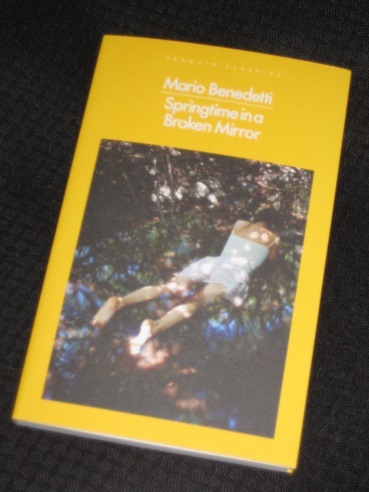 Benedetti himself did (eventually) return, but Springtime in a Broken Mirror shows that not everyone was so lucky, and that even those who were fortunate enough to escape with their lives didn’t always find a happy ending. Life moves on, often without you, and this is a lesson Santiago is to learn when he finally emerges from his captivity. Although he believes that with his release spring has come at last, in truth his long, cold winter might just be beginning.